How good is the ventilation system of your house? I bet I’ll get interesting answers to this question of mine. Those with ACs installed would be pretty comfortable with the system. Same goes for people with “Ceiling Mounted” fans. If your house is spacious and allows for an AC or a couple of ceiling fans, you are good. But what happens if the house isn’t big enough or the rooms don’t allow you the space to install an AC or a ceiling fan? Well, Wall Mounted fans are here to help. These devices provide you the flexibility of room-to-room air ventilation while you mount them on a wall. If you HAVE TO get one for your rooms, go after Panasonic FV-08WQ1 WhisperWall. I agree that 70 CFM worth of air isn’t that much. But it helps to circulate the air. A place where you can’t use the ceiling, this product is a blessing to be around. Plus, people can count on numerous benefits that they can enjoy. Give my review a read if you want to know what they are. Is Through-the-Wall Design a Big Deal? The WhisperWall is not just a name tag when it comes to the FV-08WQ1. In a small and cramped apartment, people don’t get enough ceiling height or space to work with ceiling fans. WhisperWall goes through the wall to work as exhaust and intake fan. Depending on how you position the fan, it can cover the entire room. Users have a damper to prevent back-draft. On top of that, the exterior hood protects this device from any damage whatsoever. The credit for the sturdiness of this thing goes to the galvanized zinc. Manufacturers utilized it to provide the fan with a unique shape. The installation process is painless. Moreover, it works like a charm from the first time you install it. Condenser Motor Extends This Fan’s Life! The motor itself is special. I know some guys will frown while reading the specs. I mean, They’d be like, “70 Cubic Feet per Minute? Really?” But hey, this makes the motor slow. The mechanism rotates at low RPM. This makes the fan waste less energy. It also creates less friction and heat within the motor. On top of that, there’s a condenser in place. Whenever the motor is at risk of being overheated, this condenser does its job of keeping the temperature under control. The whole mechanism is enclosed too. Don’t expect any of the outside interference to harm the motor itself. Kudos to the Blower Wheel! 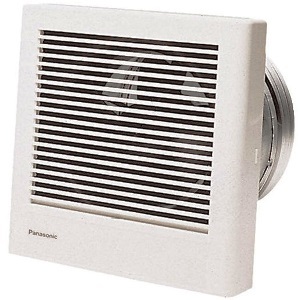 What people don’t know is that Panasonic FV-08WQ1 uses a propeller motor to drive the air in and out. Blower wheel, in this case, plays a vital role. Naturally, the manufacturers kept it in mind when coming up with the design for the wheel. The wheel is wide. The shape of the wheel allows it to draw air from both sides (inside and outside). As a result, the device can function as exhaust or intake fan depending on what you have in mind. It is easy to clean as well. Just remove the grille and use a cloth to wipe the dust away! The Brand is Known for Quiet Fans! And this one is no exception. The blower wheel needs to be thanked for the noiselessness along with the “Capacitor-Style” motor. The wheel rotates at a low RPM and draws in 70 cubic feet of air per minute only. Along with that, the lubricated motor runs slower than usual as it doesn’t heat up. All these things allow the fan to create less friction than other models or brands. People can have a nice afternoon nap or a good night’s sleep thanks to a quiet warrior that strives to keep you cool by taking the stale air out. That too, by cutting down on your electric bills. To be honest I leaked the fact that the machine saves you power and electric bills. Look through various forums and manufacturer’s website and you’ll see that this little tool comes with multiple certificates. One of these is the “Energy Star” certificate too. It means that Panasonic has designed the motor, blower wheel, and overall mechanism in such a manner that it saves energy by 60% compared to other brands. In FV-08WQ1 WhisperWall, you have a cheap fan that makes the maintenance cost even cheaper! Don’t Worry About the Safety! Cutting down on electricity bills? Check! But what about the most important issue of them all? The safety of a user? Fortunately, the FV-08WQ1 WhisperWall 70 CFM Wall Mounted Fan passes that trial with flying colors as well. You have lubricated parts in the motor to keep it running without over-exertion. Even if the fan is at risk of getting overheated, makers have installed a “Thermal Cut-off” system. It allows the machine to cut off power prior to an accident. Once things return to normal, people can turn the fan back on by putting this thing in place. It’s as easy as pie. The design and the material used to come up with the fan are impressive to say the least. This little device functions both as an intake and the exhaust fan depending on air direction. You guys know that it is EnergyStar certified. But please note that it uses only 17 watts of power. This WhisperWall fan is rated 0.8 Sones by experts making it virtually noiseless product. With all the thermostat cutoff system people will be safe as it cuts the power when it gets too hot. This fan can only work with air around 70 Cubic Feet Per Minute. It’s not particularly suitable for commercial-grade using in large establishments. Say what you will but wall-mounted fans do have their place amidst other things as well. 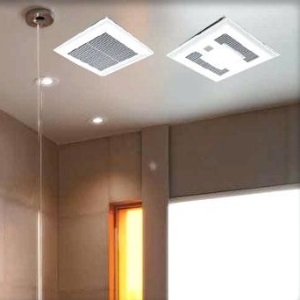 When you are in need of an exhaust fan, ceiling-mounted products aren’t always viable. They are certainly not cheap. The only way out is to have ones that can penetrate through the rooms’ walls. While you’ll find other options, Panasonic FV-08WQ1 seemed just fine to me. Also, it is the best alternative to traditional exhaust fans when you consider the longevity of the design and motor. I’d recommend this for kitchen, bathroom, and bedrooms too. 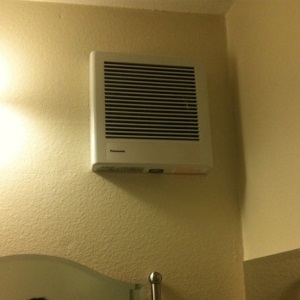 You just need to keep in mind that you need 8-inch ducts to install this device correctly. Also, be sure to run maintenance from time to time. I’d advise cleaning the fan in every four to five months just to keep it in shape.